The remains of a late 11th or early 12th-century motte and bailey castle with three baileys! As far as we know the castle was occupied until the Black Death, which seems to have decimated the population of the castle and nearby village of Cainhoe. The motte and bailey fortification at Cainhoe was begun by the Norman lord, Nigel d'Aubigny (or d'Albini), who died in 1100. We do not know exactly when the castle was begun, but there is no mention of it in the Domesday Book of 1086, so it seems likely that the castle dates to the last decade of the 11th century. D'Aubigny was a powerful lord and owned vast estates in Bedfordshire. We know little about him save that he had 2 children and was an ancestor of the Earls of Arundel. The castle served as the main seat of the d'Aubigny family until 1272 when the last of the line, Simon d'Aubigny, died without an heir. The inheritance was split among 3 sisters, and the estate passed through the hands of the de Lacy family to the Nortons, and finally to the Grey family, Earls of Kent. We do know that the castle was occupied until the coming of the Black Death in 1348. It appears that the entire population of the castle and the surrounding village died, and the site was abandoned. By 1374 the castle was reported in ruins. 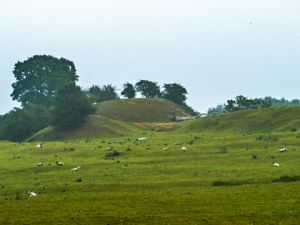 It was never rebuilt, and today only the turf-covered mound remains, with earthwork banks outlining the bailey enclosure. The site has been excavated three times. Among objects recovered near the castle site was an iron dagger, dated to the mid-15th century. There were also medieval ox and horseshoes found, and a large number of pottery sherds dating to the 13th century. The motte occupies a natural sandstone outcrop, rising just 11m over the surrounding floodplain. The motte is 60m diameter at the base, rising to a conical top some 10m across. A ditch up to 13m wide separates the motte from three irregularly-shaped baileys. The westernmost bailey has been subject to quarrying at some point so it is somewhat more difficult to make out. The baileys were defended by dry ditches and a small inner bank on one side. There is a causeway of earth crossing the south bailey ditch, but this might be a later addition. Aerial photography has revealed a moated site with a fishpond to the west of the castle mound, but this may be unrelated to the Norman fortress. There is a public footpath from the High Street in Clophill, opposite Town Shott. The field has permissive access, so visitors can explore freely.